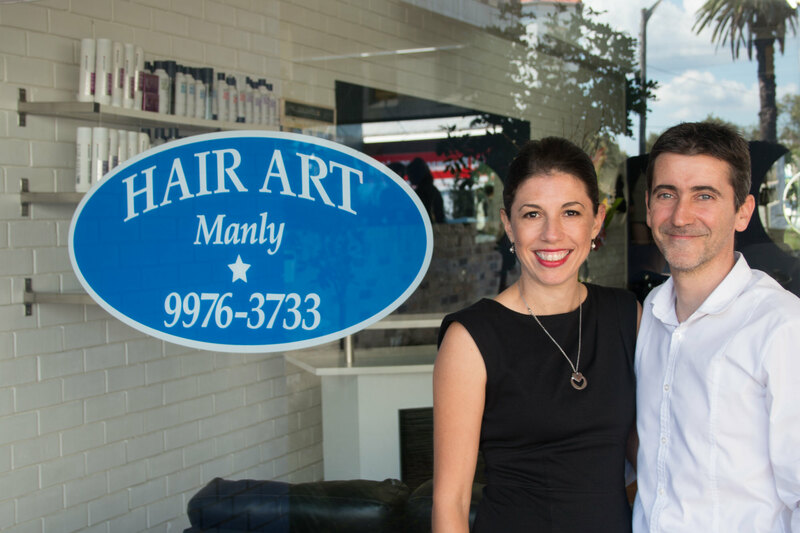 Maria and Martin are the owners of Hair Art Manly.Open since 2003, we are proud to be still providing a personal and professional service. We cater for all age groups and all aspects of hairdressing. Hair Art offers the latest techniques in cutting and colouring and recommend and use Goldwell/Kms products, which we support and guarantee results every time. Trouble free parking is provided at the rear of the salon so you can relax and enjoy the experience. Come in and try us, or book in for a complimentary consultation so we can listen and discuss your needs……. You’ll be glad you did! My wife and I have been clients of Hair Art Manly ever since it opened it's doors 12 years ago. Our teenage kids have also grown up as Hair Art faithfuls. Maria and Martin provide everything you need from a good hairdressing salon, first and foremost excellent hairdressing! Hair Art offers a warm and friendly atmosphere, ease of parking and they never run late. If you desire a great hairdressing service while enjoying the time in the chair, then I would have no hesitation in strongly recommending Hair Art Manly. It is always a pleasure to go to Hair Art Manly. Maria and Martin are a very professional, knowledgeable and experienced team. Even though we have moved from the area 8 years ago, I still travel the distance to have my hair cut and coloured on a regular basis. I trust Maria completely, which is SO important to me, as I would in the past, have rather gone to the dentist than the hairdresser. Maria is professional in all aspects of her craft and gives advice on colour and style, should I need or want it. One of my daughters has Martin cut her hair and she travels from Erskinville! Always a fun and relaxing couple of hours with a great cup of coffee. I have often been asked 'who does my hair/where do I go?' So great testament to them, from a very satisfied client. Unlike me, they are ALWAYS on time too! I met Maria and Martin 10 years ago, even though I have now moved out of the area i still travel to them for my haircut. I love that I am dealing with professionals in their craft. Even better, both my kids are now growing up with them cutting their hair as well. Any one wanting a great haircut should visit Hair Art Manly. It gives me great pleasure to recommend Maria and Martin. They are both expert hairdressers and Maria is a star colourist. The care they give to all their clients is outstanding and they are especially supportive to seniors and small children. Going to Hair Art is a social occasion I look forward to every month, not just for the resulting hair style but also for the pleasure of their company. I have been a client for about 7 years. The atmosphere is friendly and relaxed and Maria and Martin listen to my needs and help me make the right choices. As an extremely happy and satisfied client I highly recommend Hair Art Manly. I have been a client for many years, the fact that I have stayed a regular for so long is testimony to Martin's reliability and consistency over the years. Martin cuts hair as you want it to be cut, he is methodical ,careful, always on time (a major plus when your schedule is tight.) There is no pressure, I can sit and relax and often just ``chill out!`` I would recommend this salon highly, with no intention of going any where else. I hope Maria and Martin continue at Hair Art for as long as I have hair to cut! Maria and Martin @ Hair Art Manly are the best! For years I have struggled with my ``difficult`` hair. It's very long, thick and curly. I always leave there feeling like my hair is normal again. I would never go anywhere else!